Molly will in due course be added to Tia’s ‘Wall Of Shame’ listing greyhounds that have been used and abused by the racing industry. 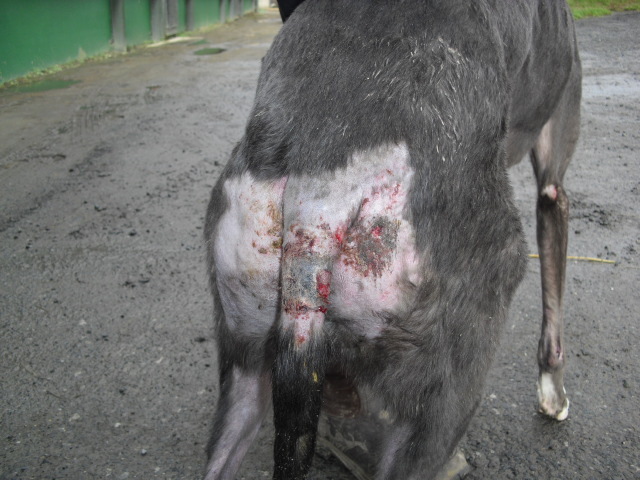 If you as an individual or rescue know of a greyhound that has suffered abuse at the hands of the industry – please email debra.rothery@btinternet.com who will add those details to the Wall Of Shame which helps us to expose the cruelty of dog racing. 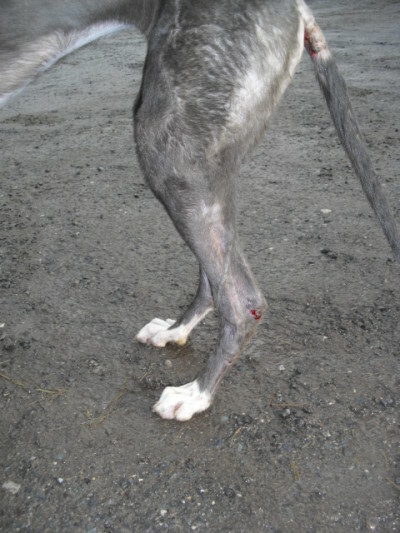 Heres Molly was born in Ireland and raced at Kinsley, her last outing was in May 2013. Molly only managed to get her head in front once in her career and her connections threw in the towel. She was given away by her trainer, almost certainly at Highgate Flapping Stadium as one of a batch of failed racers. Trade waste disposal. Young Molly was out lamping a week ago and her owner managed to drive over her in the dark. He had thrown her from the vehicle and she got caught under it. Having met him we suspect he wasn’t in a legal frame of mind at the time. By rights she should be dead, however the softness of the ground meant that she sank under the weight of the vehicle and survived. The injuries were a few days old and she had a raging temperature.